Harpeth Hall is an independent college preparatory school for young women where each student realizes her highest intellectual ability in the sciences, the humanities, and the arts, and discovers her creative and athletic talents. Harpeth Hall develops responsible citizens who have global perspectives and make meaningful contributions to their communities and the world. With a tradition of excellence and a commitment to life-long learning, Harpeth Hall educates young women to think critically, to lead confidently, and to live honorably. The Design Den is equipped with a wide array of hand tools, power tools, and electronics. All of the tables, chairs, and storage components are either stackable or on wheels so the space can be configured to meet the needs of the project at hand, whether it is students running a robot course, creating an intricate wood design, or drawing and planning their latest 3-D creation. The walls and tables are covered with Idea Paint to allow students to write and design on almost every surface. A glass partition wall can divide the large room into two more intimate spaces. Concrete floors, bright colors, and exposed hardware, give the room a feel that is unique to any others on campus. We are excited to see what our girls will do in the months to come! The new Design Den is a place for students to imagine, design, and create. In the Design Den, students take their imaginations and connect them with tools and training to make their ideas come to life. 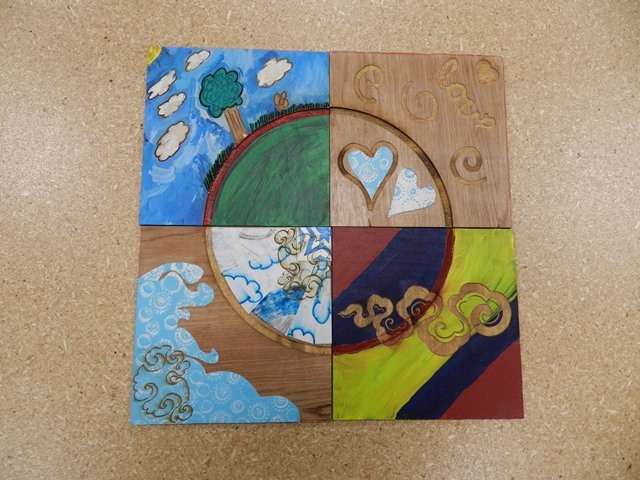 Student designed tiles that were etched on laser cutter then painted and put together. The mission of the Design Den is to broaden the critical thinking and creative process of our students and our faculty. We can’t wait to see their dreams take life. In the future, we plan to purchase additional hardware as well as provide continued support and professional development. Just as we collaborated with other school prior to the construction of our maker space, we hope to collaborate with other schools as they begin their journey. We also hope to work with other school to expand opportunities for our students and faculty.